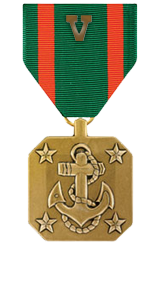 Heroic achievement in the superior performance of his duties while serving as independent duty corpsman, Company I, 3d Battalion, 3d Marines, Regimental Combat Team-7, from March to September 2006, in support of Operation IRAQI FREEDOM. During this period, Hospital Corpsman Third Class Timme performed his duties in an exemplary and highly professional manner. Serving as the duty corpsman for both the firm base aid station and company quick reaction force, he consistently treated all casualties under intense, arduous, and often dangerous circumstances. Over the course of the demanding deployment, Hospital Corpsman Third Class Timme treated Marines, Iraqi Army soldiers, local nationals, and insurgents who had suffered traumatic injuries and needed immediate wound care. His tireless efforts and absolutely impeccable medical skill was a combat multiplier for Company I and undoubtedly saved lives. Hospital Corpsman Third Class Timme’s initiative, perseverance and total dedication to duty reflected credit upon him and were in keeping with the highest traditions of the Marine Corps and the United States Naval Service.